Below is a quarter matrix that lists the courses that will transfer to Mount Carmel College of Nursing (MCCN) from Columbus State Community College (CSCC) and The Ohio State University (OSU). Courses also can be transferred from other colleges/universities as well. Transfer credit is granted based on the college/university course grade of “C” or better, total credit hours for the course, and the course description. Science courses must be completed within the last five years in order for transfer credit to be granted. NOTE: Mount Carmel College of Nursing reserves the right to change any course requirements. 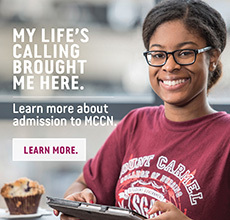 You must apply and be accepted to MCCN before any transfer credit will be officially awarded. MCCN has designed an integrated curriculum, and students are strongly encouraged to complete coursework, especially science courses, at MCCN. * Both Anatomy and Physiology must be complete to receive credit for SCIE 123 and SCIE 124. Mount Carmel College of Nursing does not accept BIO 1121 or BIO 1122 as equivalent transfer credit from Columbus State Community College. Credit will not be granted for science courses completed at another institution more than five years prior to Mount Carmel admission and enrollment.